Today we will wire up a TMC4361A-EVAL + TMC2130-EVAL combination to drive a stepper motor closed loop with an Arduino Uno. The encoder used for this test has a resolution of 10.000 cpr respective a resolution of 40.000. For this tutorial the Eselsbruecke got a soldered connection between +5V_USB (pin 5) to +5V_VM (pin 42) to get +5V for the encoder. You can use jumper wires as well but make sure the connection is properly. The wiring is very simple. You will need 9 jumper wires. 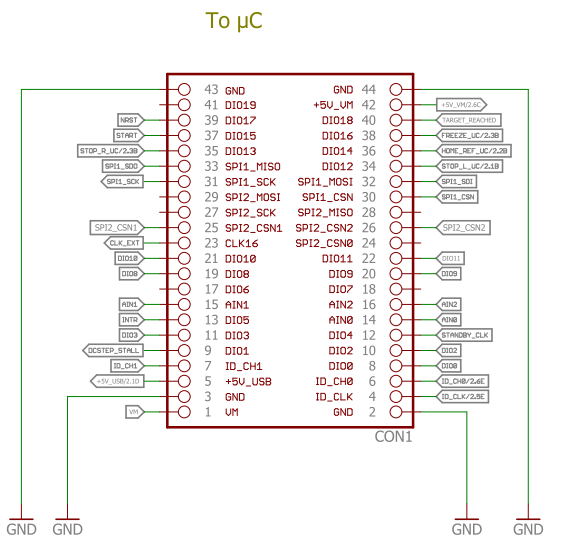 To make the wiring more easy you can print out the TMC5130-EVAL_Pinning.pdf (used from a previous blog entry) and cut out the template to mount it on the connector header of the TMC4361-EVAL (As seen on illustration 4). As a reference you can use the TMC5130-Eval_v15_01_Schematic.pdf. Here you’ll find the signals that are on each pin. The configuration is documented in the comment section of the Arduino code. The Arduino Code below does not need any additional libraries. The SPI library comes with the Arduino IDE. The program initializes the TMC2130 thru the TMC4361A-EVAL (cover datagram) and the TMC4361 itself. It will rotate a 200 full step motor 2 revolutions to the one and 2 revolutions to the other direction depending on the wiring of the stepper motor. Please use either the TMC4361 and TMC2130 datasheets as a reference for the different registers (Download links below). * followed by 4 data bytes. This is 40 bits (8 bit address and 32 bit word). * write. The MSB is transmitted first on the rising edge of SCK. The Arduino_TMC4361_TMC2130.zip file includes the pinning template, the TMC4361-EVAL schematic and the Arduino project. Please check the datasheet chapter 3. SPI Interfacing. All registers that are readable simply need to be send with its corresponding address with any dummy data. An example can be found in the datasheet on page 17 (datasheet revision 1.21). Do you have the sample code for Step/Dir mode to control the stepper motor (TMC4361A-LA+ TMC2130), THANKS.. This is a .tpc file. If you are using the Landungsbrücke or Startrampe you can use our TMCL IDE to start the PC/Host host Tool you’ll find in the menu entry Tools. Within the Tool click on the TMCL/PC menu entry and select Options… –> Module Assignments…. Now you need to assign the listed module on the left to the Assigned modules on the right, cope to code and edit the first line of the above .tpc file with the generated line. If you do not use the Landungsbrücke or Startrampe you can use the .tpc file to help yourself on editing the code. All WMCcommands mean write to micro controller. Those are essentially the SPI commands. I hope this helps you. Let us know if you need further assistance! Thanks, I will try it and come back to you.. I have set up the platform with my own micro controller, and test the source code with above, but now the problem is that I need the similar source code for Step/Dir mode to verify the chip & driver performance. So right now maybe it’s not possible to get the hardware Landungsbrücke or Startrampe from trinamic. Is it possible to send me the text file similar to the code above to my email. I have opened the file, will try it.. Thanks. Let me know if and how it worked for you. If anyhting is unclear or you need additional help, please do not hesitate to reply on this comment. So far so good. I try to summarize some questions and list on this comments together later.. I have summarized 5 questions below. Hopefully you can help me on this..
1. Under SPI mode Max speed. a. How to calculate the max speed limit VMAX in pps? This value how to match 400.000pps. What’s the formula? c.	When I test the speed with my existing hardware (described as above), I measure the actual motor speed is around 570 rpm, not same to the sample 120 rpm (400.000 pps). Is it any hardware or parameter I need to set differently due to the hardware difference? During my testing stage, I noticed that the moto engaged status (when the motor shaft become engaged) is related to 2 registers below. But how to get back the motor engaged/disengaged status? Can you show me the register? This encoder is 10cpr or 10,000cpr? I guess it is supposed to be 10cpr, but its resolution seems too low, and this type of encoder is very rare, so a bit unbelievable. I am a beginner with the Trinamic Chip, if whatever statement I made is not clear or wrong , please let me know.. Thanks. If any information you want to know about my platform, just let me know. Am I missing something, but can`t find the type and model of the incremental encoder… I am trying but only text that I find is: “The encoder used for this test has a resolution of 10.000 cpr respective a resolution of 40.000.”. And if it is possible, explain to me (us) the difference between the two data: 10x10e3 cpr and 40x10e3. When load increases Will speed remain? Yes. First the controller will adapt automatically the current to overcome the load condition by maintaining the target velocity. If the physics of the motor are exceeded, with more load than the motor can handle with set maximum current, the motor will reduce velocity as long as the overload condition happens. As soon as the overload condition is overcome, the motor will speed up to catch up the “lost” time. Hope that answers your question sufficient. Let us know if you need further assistance. The encoder has 10.000 lines but as the A and B signal are 90 degrees out of phase you have in total 40.000 “states”. This is called quadrature. Please let us know if this answer is sufficient and if we can further assist you. Thanks for this cool Projekt. PS: This blog is really nice! Thanks J for the positive feedback! Thanks for this inspiring article! I’m currently working on a pan/tilt controller with the same hardware, but with open loop. Adapting your code I was able to get the motor oscillating the two revolutions forth and back, however with a terrible high frequency noise. I figured out that using Timer1 on an Arduino Uno gives you only 8MHz, so the whole system (including PWM) runs on half of the speed. Hi. How can I wire the TMC2130 directly to an Arduino Uno, without using the EVAL board? Thanks! The connection is pretty much the same with the TMC2130-EVAL except you need to connect the STEP/DIR signals of course. Hope that guides you to the right direction. Sounds great. Have you tried out stealthChop already? This will make the motor completely silent and helps with smoothness in motion as well. To activate stealthChop set bit en_pwm_mode to 1 in the GCONF register (0x00). Hope that makes your motor smooth and audbibly noiseless. i am having hard time getting the above codes working properly. 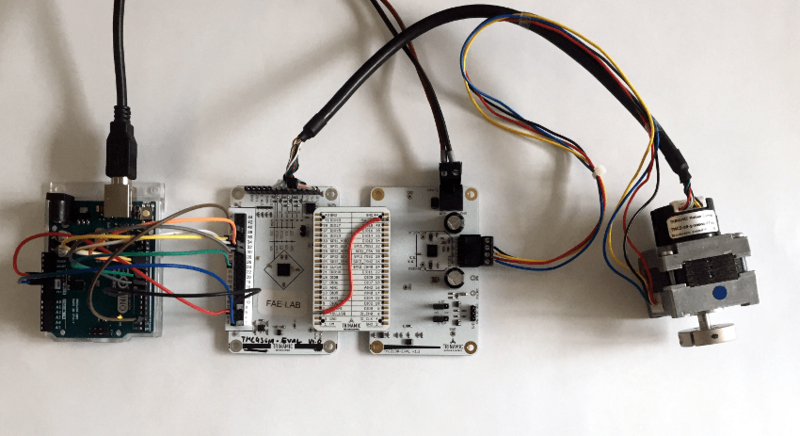 the stepper motor only does one step. would you mind sending a simple code that makes the stepper motor rotates in one direction with steady velocity. How about an Arduino + TMC4361A-BOB + TMC2660-BOB ? Any compatibility issues? With the proper connections it would pretty much act the same way as the EVAL boards so no issues. As you get the schematics on the respective pages on our webpage should be an easy translation. I assume that the encoder you are using might have another resolution as in this example? Have you changed those settings already? The encoder resolution needs to match the encoder you are using and you need to make sure the direction of the encoder is matching the motor direction. If not you can change the cables to have it matched or change the direction bit in the TMC4361A. To confirm, the external clock on the TMC4361 is being controlled by the timer pin (pin 9) on the arduino @ a rate of 16 Mhz? What is the minimum ans max speed we can run the clock at on the TMC4361? Yes, pin 9 is been used with a timer and toggles the pin with every system CLK cycle. Therefore the CLK output respectively CLK of the TMC436A-LA is 8MHz. The minimum is 4.2MHz and the maximum is 30MHz. Please have a look into the TMC4361A-LA datasheet Rev. 1.24 on page 219.